What Jagan Said About YCP Manifesto? YS Jaganmohan Reddy made it clear he isn't someone who indulges in divide-&-rule. He claims to be averse to creating rift among people of two communities for political gains. 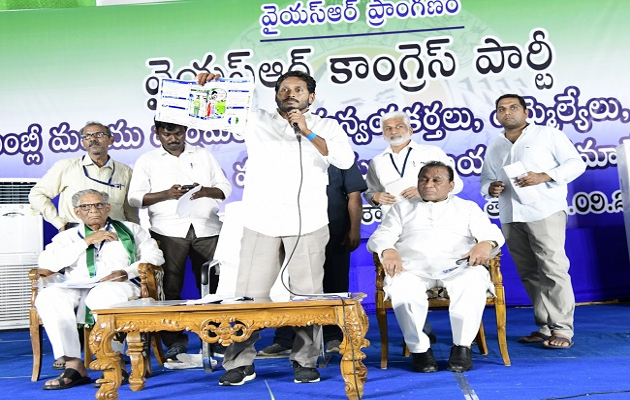 The Opposition Leader clarified YCP Manifesto willn't be like the heavy booklet given by TDP. 'Our Manifesto will be covered in a single paper. If you type YSRCongressParty.Com, You could see the Manifesto on our Website. I'm unlike Chandrababu Naidu. It's very easy to download! I would do everything promised by Me what-so-ever. No. of promises doesn't matter, what's important is how many of them have been fulfilled. Those who can't fulfill the promises don't have the moral right to continue in the power. I don't need the posts if I can't fulfill my promises,' he said. One has to have guts to make such statements and stand by his/her words. Each and every comment made by Jagan has been awakening public and guiding them in the right direction. It's up to the people to decide who should rule them..!